Last November, an assortment of beautiful photographs, taken from high above the Amazon Jungle was released to the public. The images allow us to see the world before our own; a glimpse into our past; a quick dichotomic vision of our historic collective achievement as humans. The pilot and the anthropologists on board both knew—from previous trips to the area in 2008—that they had better keep a good distance from the target if they didn’t want to get arrows shot at them. The pictures they were able to take revealed another distant look at a truly primitive civilization that is still untouched by modern influence and technology—living today as if it was the Stone Age. 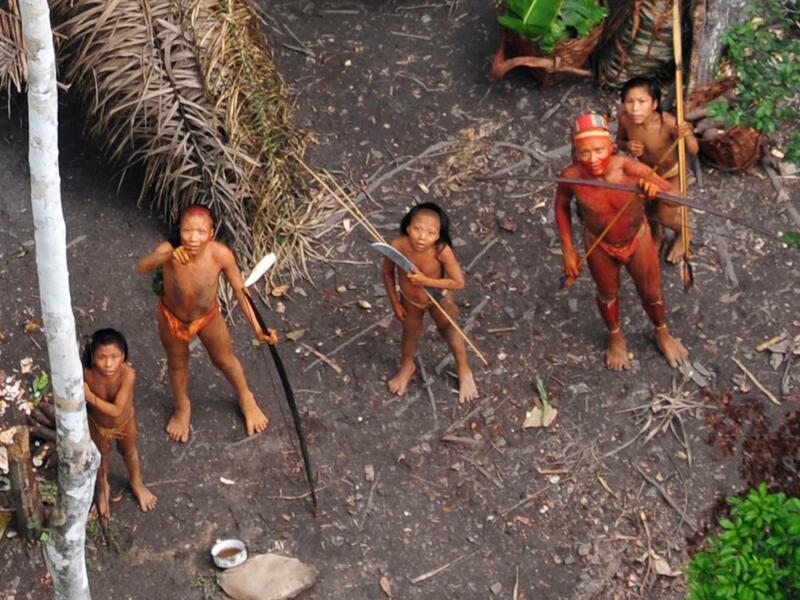 There are an estimated 100 “uncontacted” tribes around the world. Located mostly in South America, Africa, the Indian Ocean and Papua New Guinea. 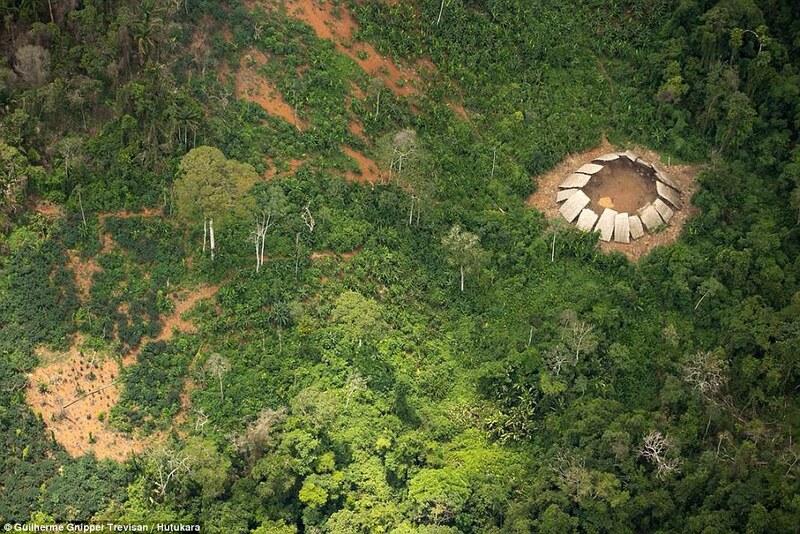 The existence of these precious “uncontacted” or “isolated” tribes are being threatened by the illegal industry that constantly creeps into their protected territory. After the tsunami in 2004, Indian government officials went to North Sentinel Island, a small isolated island that’s a part of the Andaman and Nicobar Islands in the Indian Ocean. They were going there to survey the damage done in the area and also to grasp the opportunity to check up on the locals. The Sentinelese people are thought to be direct descendants from the first migrations from Africa. They have been living virtually uninterrupted for 60,000 years. They have rejected and threatened all colonial and industrial contact, keeping their secrets locked away from the rest of the world. In 2006, two fishermen got a little bit too close to the island and they ended up dead. Not too far away from North Sentinel Island, on South and Middle Andaman Islands—two of the three major islands—a tribe called the Jarawa has had their land cut in half by a controversial road. Unlike the isolated Sentinelese who have fiercely waded off contact from the surrounding islands, the Jarwari tribe was unable to keep up with the expanding local economy and expansion of settlement. Much like other tribes on the main islands, like Great Andamanese and the Onge, they have opened up to allow modern conveniences to assist their lives. The Andaman Trunk road opened in 1997 and it connects the many islands of the archipelago. Unfortunately, as these pictures show, the area quickly became a tourist attraction. In this footage (below) shared by the Guardian—an Indian policeman in 2011 is seen watching and cheering on tourists paying (or giving food to) the Jarawa to dance for the camera. This cultural appreciation, or more like demonstration, led to a lot of publicity but it hasn’t changed the obviously corrupted conditions that are taking place there. Unsurprisingly, bribes are happening all the time—probably the only reason this is happening. There was a water route that was proposed so the road can be closed. India’s supreme court has tried to close the road but they have fallen through too. 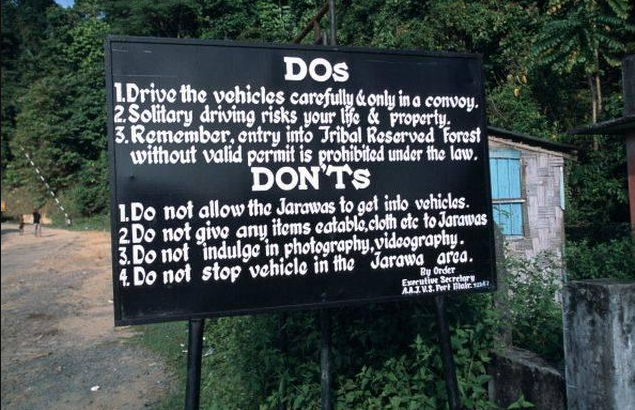 There is currently a 5km buffer zone, preventing commercial uses within the area, that is supposed to be keeping them (both the Jarawa and the Indians) safe from each other. Most recently, in March of 2016, a young boy who was on tour of the reserve with his father wandered off and got drowned by a Jarawa tribesman. This once again has raised suspicion if the Andaman Trunk road should be closed due to ever-rising tensions. Other secluded aboriginal groups around the world seem to be coming out of hiding more often due to illegal activity such as tourism, mining, logging, and poaching which only further reaches into the reserved land. There must be many other—completely off the grid, desperately-squeezed-by-civilization—rival tribes that have never been witnessed by the West, which have only intensified the situation for these once independent peoples that we are only starting to see now. For the time being, however, it seems like the “uncontacted” tribe is turning out to be a dying fad because we just want them to be either an aloof animal to take pictures of or another one of us. This is so amazing. You write beautifully, and it was phenomenal to experience another culture. Thank you. I will be sailing The Andaman Islands in February/March this year. This article is great food for thought. That’s great to hear Lisa. I would like to read a post about any experiences you have there! I’m so happy you came by and gave this post a read though because I really find these tribes to be absolutely fascinating… I’m sort of jealous of them, really.